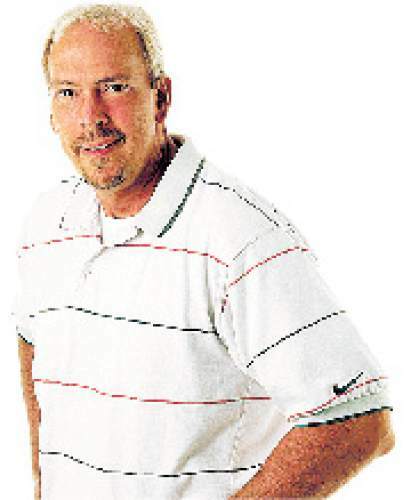 Monson: Did Ty Detmer make the right choice at quarterback for BYU? Gordon Monson Rick Egan | The Salt Lake Tribune Brigham Young quarterback Taysom Hill (7) runs for a touchdown for the Cougars, bringing BYU with in one point of Utah,in football action, at Rice-Eccles Stadium, Saturday, September 10, 2016. Rick Egan | The Salt Lake Tribune Brigham Young quarterback Taysom Hill (7) is congratulated byTanner Mangum (12), after scoring a touchdown for the Cougars, in second quarter action, BYU vs. Utah at Rice-Eccles Stadium, Saturday, September 10, 2016. Rick Egan | The Salt Lake Tribune Brigham Young Cougars quarterback Taysom Hill (7) is hit by Utah linebacker Sunia Tauteoli (19) as he runs the ball for the Cougars, in football action, at Rice-Eccles Stadium, Saturday, September 10, 2016. It&apos;s early. This is no eager or irresponsible effort to romance the backup. There have been jokes about it, nothing more than whispers and chortles, really. 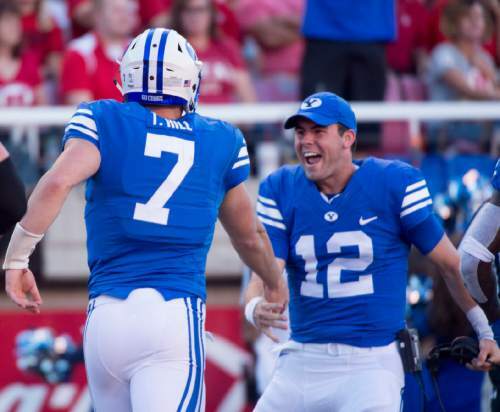 What if Ty Detmer picked the wrong quarterback to run his offense at BYU? What if the best guy to lead that thing is sitting on the bench, waiting for a turn this season that did not come, has not come, should have come? What if Tanner Mangum is the better option? He is the better passer. Anybody else wonder those things, after the Cougars scored 18 points against Arizona and 19 against Utah? Anybody else have the thought cross his or her mind on account of BYU not having a single pass play go for more than 20 yards so far? 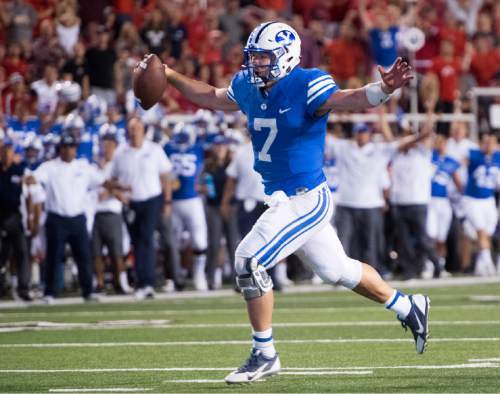 Anybody else think that throwing for an average of 189 yards a game, an average of five yards per pass, and that throwing more interceptions (three) than touchdown passes (one) might fall a tad bit shy of what BYU needs out of its quarterback? Even if for a fleeting moment, Detmer likely does and has. Taysom Hill is a preeminent athlete. We all saw his two runs for touchdowns against Utah, including the 39-yarder where he got the left edge and blew down the sideline for a score and the roll right in which the Ute defense parted like the Crimson Sea and Hill ran across the goal line like Moses with his arms extended over his head, staff in hand. How many quarterbacks in the country could have made those plays? Not many. Mangum couldn&apos;t have. But maybe, just maybe, he wouldn&apos;t have had to. Maybe Mangum would have spotted a receiver down the field and delivered a strike to the guy who was barely open enough to cradle it in for what everybody these days likes to call chunk yardage. Isn&apos;t that what Detmer&apos;s offense  the BYU offense  is really about? Isn&apos;t that what it&apos;s designed to do? How many running quarterbacks thrived in the old days under Norm Chow, relative to the number of passing quarterbacks who thrived? Even Steve Young said he never really fulfilled his vast potential until after he learned to orchestrate an offense, allowing all the parts to do their part instead of him fiddle-faddling around, then taking off down the field for yards that always beckoned, that always seemed to be available to him, but that, ultimately, disrupted the offense&apos;s flow. Hill can almost always pick up yards on his own, especially if they are short. 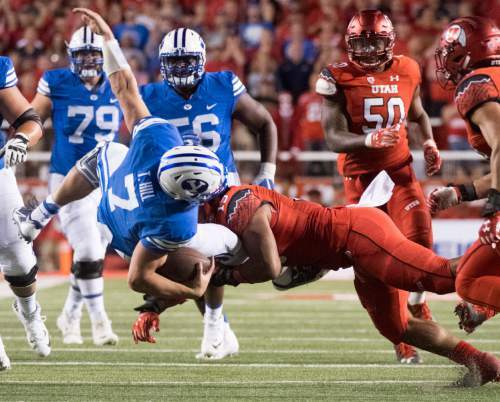 Ironically enough, the two-point conversion try the Cougars failed on in a one-play-for-the-win situation against Utah is the kind of play for which Hill is built. Why he dropped back, hesitated for a moment, without stretching the line of scrimmage horizontally, thinning out an impressive Ute defense, allowing the quick-footed quarterback to take advantage of favorable matchups, running instead straight into the teeth of that well-positioned D is a question whose answer is useless now. Two questions that are not useless: If you have a running back like Jamaal Williams, who should handle the majority of your rushing attempts, and you have a superior passing quarterback standing on the sideline, a quarterback who came out of nowhere  an LDS mission in Chile  to win games a year ago without sufficient preparation and without Williams in his backfield, would that, perhaps, be a better option, a better combination of punches, now? If your most effective play is having your quarterback drop into the pocket, look around, and then take off running, is something wrong? Another one: If Hill is your quarterback, should he be leading a different kind of offense, a more honest offense, one that straight features his running, as opposed to one where everyone else sort of pretends to be doing something on the offensive side, like decoys, like hunters in a blind blowing duck calls, and then  quack  he handles matters from there? That&apos;s a simplification  we get it. But Detmer&apos;s offense, as is, awaits a maestro who can conduct the symphony, allowing all the parts to come together to make the music right. It could be that the reason Hill is starting is because the brass and string sections cannot properly hit the correct notes, and his talents partially make up for the deficiencies. If an offensive line struggles to keep pressure off the quarterback, it is better to have a more mobile QB running around, improvising. If the receivers cannot get open and catch the ball when they are, better for the quarterback to handle business himself. But that&apos;s a horrible admission, if it is true. It&apos;s hard not to root for Hill, given all that he&apos;s been through. He&apos;s a great leader, a terrific student, an accomplished athlete who has fought off injury time and again to put himself in the position to play out his senior year. One point nobody can argue: When he does run, it&apos;s an absolute gas to watch. Maybe the offense&apos;s struggles have more to do with the quality of the defenses it has faced, an extension of faith much more believable in the case of Utah, a defensive group that is angry and talented and oh-so tough, but … not Arizona. Either way, with a talent like Mangum sitting by the side, waiting, even if growth is still needed, it&apos;s easy to wonder what he might do given the opportunity, if those other offensive parts are capable of doing their jobs. He&apos;s better suited for Detmer&apos;s offense, when properly staffed, than the quarterback who&apos;s ahead of him now. If the rest of the guys can&apos;t consistently block and catch … well, then Hill gives them the best shot at overcoming their own limitations.